So much had been written about his dad’s life, his politics, his Hollywood career . . . but little was ever revealed about Ronald Reagan the man — the private man, home with his wife, kids, and friends. And nobody alive knows more about who Reagan really was than Ronald Reagan’s eldest son, Michael himself. For the first time, his book Lessons My Father Taught Me reveals Michael’s personal insights into the qualities that defined his dad — and can help any of us succeed in our relationships and life. He argues that people in all walks of life can tap into the same power of faith and love that motivated his dad. But their relationship — and his father’s relationship with his other children — had been very rocky at times. The family had weathered a bitter divorce, when Michael’s mother, Jane Wyman, the famous Hollywood actress, decided she no longer wanted to remain with her husband. Michael wanted to show how his father successfully dealt with the personal defeat of that divorce, and remained a great father to him and his sister. He also uses this book to share the true secrets of his dad’s greatness — overcoming tremendous obstacles to become a famous actor, governor of California and president. 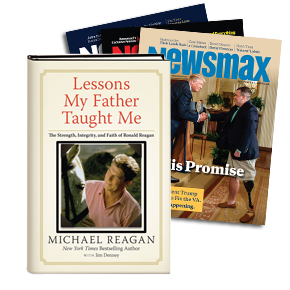 If you learn from the life and wisdom of Ronald Reagan, Michael says, you will have better relationships with your family and friends — even find greater success in life and business. In Lessons My Father Taught Me, Michael reveals several very surprising stories about his father — some even quite shocking — and many that have never been disclosed to the public before. Michael says he did this not to shine a negative light on his dad but to show that he was a human being, who learned from his mistakes and grew to be a better person because of them.